A lot has been written about the benefits of insulation - it keeps your home comfortable and your utility bills down. But how do you figure out if your home needs insulation, and if it does, which kind? Is one material better than another? How can you find out more about various insulation brands and which products they offer? And perhaps the most important question of all: how much could the upgrade cost? To figure out if an insulation upgrade makes sense for your home, you'll need a general understanding of the types of materials available for residential use, the primary brands, where the various insulation products are commonly used, and their average costs. However, keep in mind that prices can vary quite a bit based on your location and unique jobsite conditions, so it's a good idea to ask for estimates from local insulation contractors. A basic law of physics is that warm air gravitates toward cooler temperatures. This means that as your heating system works to warm the interior of your home during the winter, the heated air is constantly seeking to move to unconditioned cooler areas such as the attic, garage, basement, or beyond the exterior walls. The inverse is true during the hot summer months when warm air outside your home works to get inside where the air-conditioning is nice and cool. Your home has a physical barrier that separates the conditioned interior spaces from the hot or cold temperatures of the great outdoors. This barrier, known as the outer envelope or shell, normally consists of the exterior walls, the attic or roof system, and the ceiling or outer walls of the basement or crawl space. The primary material used in the various configurations of your home's outer envelope to help prevent heat transfer from taking place? Insulation. There are several different types of insulation, and some are a better choice for specific areas of the outer envelope than others. Whether you're insulating a home under construction or upgrading an existing structure can also determine which product might be the best selection. An insulation contractor can help you determine which product is best, but we’ve broken down the details below in the meantime. How can you tell how well your insulation is going to work? That’s determined by a rating system that assigns an R-value. The higher a product's R-value, the better it should be at deterring heat transfer through the outer shell. See "How insulation R-values can affect your bottom line" to find out more about R-value ratings. 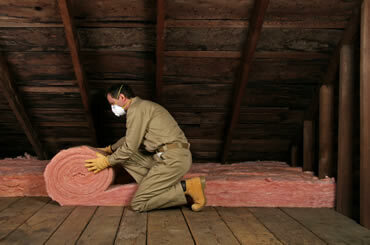 The article "More insulation: A hot idea -- or not?" can help you figure out where your home might need additional protection. Keep in mind that batts are not a good choice in areas subject to moisture intrusion. You can hire an insulation contractor to help you determine if batts will work for your home. Pricing may vary depending on house location and material manufacturer. High density batt insulation is available to obtain higher R-values in areas with limited space. Batt insulation can also be layered to increase R-values. Owens Corning, CertainTeed, Johns Manville, and Knauf are a few of the best known batt insulation manufacturers. If you're insulating lengthy areas such as attic floors or crawl space ceilings, purchasing fiberglass or rock wool in rolls might be a better choice than batts. Rolls allow long runs without the breaks in heat transfer protection than can occur when installing batt sections. The insulation is available faced or un-faced and in most of the same R-values as batts. It is also made by many of the same manufacturers and has very similar pricing. Loose insulation that is blown into place with a special hose is called blown-in insulation. The material can also be poured into position. The three most common materials used as blown-in insulation are fiberglass, rock wool, and cellulose. Cellulose is a green building material often made from recycled newspapers. Blown-in insulation is probably best known for its use in unfinished attics, but may also be an excellent choice for upgrading exterior walls of existing homes. The material can be installed through easily repaired holes drilled into the walls from the interior or exterior of the house by an insulation contractor. Insulation depths for listed R-values may vary slightly depending on material manufacturer. Prices quoted include installation labor and may vary by location, material manufacturer, and contractor. CertainTeed, Johns Manville, and Owens Corning are a few of the best known makers of fiberglass blown-in insulation. GreenFiber and Nu-Wool are two of the primary manufacturers of cellulose insulation. To find other sustainable insulation products like cellulose, see "Sustainable insulation materials: 7 superb options." When upgrading the insulation of an existing home, don't overlook the additional R-value that can be achieved by installing foam insulation boards. The material is manufactured in various thicknesses and is normally sold in 4 by 8 foot sheets, but other sizes are available. The composition, density, and thickness of a manufacturer's product combine to achieve their R-value ratings. R-7.5 - 1.5 inch thick foam board called INSULPINK by Owens-Corning. R-6 - 1.5 inch thick insulation board in the CB150 boards line by CertainTeed CertaPro. A hefty 4-inch thick board – the thickest available in this line – has an R-value of 16. R-3 – ½ inch insulation board from DOW STYROFOAM sheathing. DOW's STYROFOAM insulation boards are also available in ¾-inch and 1-inch thicknesses with R-values as high as five in the 1-inch model. Foam board insulation costs can vary depending on board thickness and manufacturer. Expect to pay in the range of $.28 to $.38 per square foot for ½ inch material and $.60 to $.80 for 1.5 inch thick boards. When choosing a foam insulation board for interior use, verify that the product being considered meets your local building code's flammability requirements. An insulation contractor in your area can help you ensure you’re up to code. You can find insulation contractors to help you determine if spray foam is the best choice for your home and about how much of it you’ll need. Spray foam is available in two configurations: open or closed cell. Open cell is less expensive than closed, but also has less R-value per inch of depth and is more likely to be damaged by moisture. An R-value of 13 would require about 3.5 inches of open cell spray foam at a cost of about $.90 per square foot. The same R-value can be achieved with closed cell at a depth of about 2 inches and a cost of around $1.40 per square foot. Spray foam insulation costs vary by manufacturer, but expect to pay in the range of $.44 to $.65 per board foot for open cell and $.70 to $1.00 for closed. These price estimates include installation labor. A board foot is 12 inches long by 12 inches wide by 1 inch deep. Icynene, Inc, Johns Manville, and NCFI Polyurethanes are also well-known spray foam manufacturers. To find out more about the pros and cons of each type of insulation and how long they might last in your home see "Insulation: Can it last as long as your home?" To get a free insulation estimate, click here.